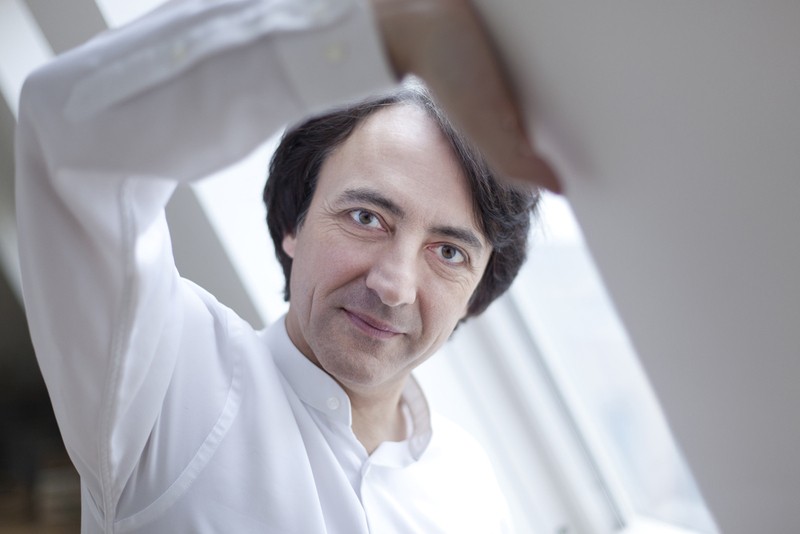 Jean Efflam Bavouzet, piano; Playhouse, November 19, 2013. Seemingly discovered by the legendary Sir Georg Solti in the mid-1990’s, many of us had not heard of 51-year old French pianist Jean Efflam Bavouzet until his magnificent recordings of Debussy’s complete piano music appeared just over 5 years ago (Chandos 10743(5)). The response was like a shot heard round the world. My own first reaction to hearing these interpretations was that they really were close to perfection, so natural and ‘right’ were their articulation and emotional feel. Perhaps I wouldn’t want to hear the works to be played in any other way! Again, hearing only a few notes of the Gramophone award-winning recording of Ravel G-major piano concerto, I felt exactly the same thing: ‘absolutely right, just what the composer intended’. Having also recorded Ravel and Bartok earlier, Bavouzet has now already moved part way through a projected complete cycle of Beethoven piano sonatas, as well as recording a number of volumes of Haydn sonatas. And the superlatives keep on flowing! ‘Hat’s off’ to the Vancouver Chopin Society for being able to bring this pianist to Vancouver, especially with a programme that so richly displays his talents. The seven Debussy preludes from Book One gave us a wonderful sample of beautifully clean, crafted pianism, very sensitive to tone colour and rhythmic characterization. However, it was his performance of Ravel’s Gaspard de la Nuit – one of the pinnacles of all piano writing – that showed just how immediate and concentrated his communication can be. Bavouzet’s playing certainly has a keen sense of structure, colour and detail, a formidable technical facility, but there is also an intelligence and a warm, human voice that transmits directly to the listener. The shadowy opening of Gaspard was indeed atmospheric but all the notes were so clear and perfectly placed. We were moved on so naturally to the more passionate outbursts that follow but never once were we allowed to lose sight of the beginning. The desolate, inexorable motion of the following movement was conveyed with subtlety but here the pianist added just enough sultry warmth and sensuality to bring a richer feeling. The variety of the last movement came out stunningly with great poise and virtuosity, some of the fire and attack that we saw towards the end almost suggesting pianism without bounds. The Bartok Piano Sonata (1926) is a work that we almost never hear, and all its insistent, barbaric folk rhythms link it to the composer’s First Piano Concerto. This is a work with high technical demands but what impressed me here was the judgment in Bavouzet’s playing. The repeated rhythms of the first movement were so crisply articulated with a perfect understanding of the ‘pulse’ and development of the movement. The second penetrated Bartok’s ‘night music’ with depth, while the final movement brought all the great flurry of notes that it is supposed to. For all this, it was Jean Efflam Bavouzet’s performance of Beethoven’s ‘Waldstein’ Sonata that was the real eye-opener for me, bringing a much more vivid realization than usual. Starting from a very precise articulation of the first movement’s opening ostinato, things quickly opened up into moments of frenzied drive, making Beethoven’s world seem much more unsettled and volatile. The lower piano runs were given a demonic insistence while often the right hand phrases came out as cascading waterfalls that flowed unstoppably onward. These episodes of unbridled momentum would be sharply contrasted with those of more serene contemplation. The result was daring and intriguing. The quiet opening of the second movement also took me to a world that I had not been before; somewhat shadowy and disembodied, perhaps akin to Gaspard de la Nuit. Then, after a beautifully woven transition into the final movement, the closing prestissimo again had an almost manic drive and thrust. Beethoven’s ‘hammerblows’ in the middle were played so emphatically that I was seemingly taken to the ‘Great Gate of Kiev’ for a moment, before the music was hurtled wildly to its conclusion. Certainly, one might ask whether Beethoven should really have such a ‘larger than life’ projection, but the conviction and intelligence of this playing simply took us on this riveting journey whether we liked it or not. Quite remarkable!